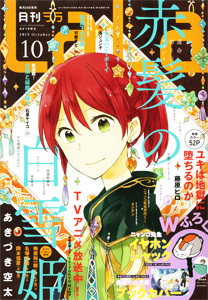 Now for some bad news: chapter 81 will not be released until the end of July, so we have a three month wait before we see what becomes of Haruhi’s …At the end of the chapter there’s a notification that beginning with Lala issue 9 the story will be rushing towards conclusion and that there will be an important announcement in Lala 8 about the planning of the story’s climax. I don’t know whether this is notification that the Ouran series is ending or whether this is notification about the end of the current story arc. So, in light of this, I’m going to take a wait and see stance and see what the announcement in June says and then wait to to see whether the story continues when chapter 81 is released. In light of the Ouran news, I have updated the group’s release schedule. Less Ouran = more Orange Chocolate!!! I will not give any interpretation upon that. I think that it's best to wait for the announcement and chapter 81. Also, on Hatori's blog the latest posting says something about her trying to upload a notice to Lala issue 5 and 6 , but it's not specific about the nature of the notice. It looks like Hatori will try to upload the notice again on the 25th or the 26th. I guess I'll check back to the blog and the Lala tomorrow to see what's going on. Regarding Raw Paradise's closure and redirection to Shueisha's website, I seem to have the impression that only Kodansha and Shueisha are the only ones acting. Hakusensha hasn't done anything yet. Do you think it's because of the licenses of overseas publishers (of their published manga) causing them not to be as affected as Kodansha and Shueisha? Related note, Sony Music Japan is also acting faster on Youtube for all those music videos of their recording artistes, uploaded by users. @Amutoislove — Sorry, but I'm not going to post any raws considering the recent crackdown. @Sapphire Pyro — yes, the series is ending, but there is no concrete indication of when. Hopefully, that will be clarified in the June announcement. I'm actually happy about the 3-month break because I get work on other manga than Ouran.